With the release of service pack 3 for Simpana 9, CommVault adds full support for VMware vSphere 5. 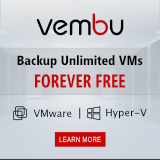 Many organizations struggle with rapid data growth, expanding virtual server deployments and increasing data center consolidations because legacy backup and recovery solutions just can’t cope with the demands of new virtual infrastructures. With vSphere 5, VMware raises the bar again and pushes the limits of performance and scale. Virtual machines can now be up to four times more powerful than previous versions. With full vSphere 5 support, CommVault claims it can keep up with VMware’s pace. CommVault Simpana 9 with service pack 3 delivers the ability to protect hundreds of VMs in minutes, scale to protect thousands of VMs and provides an off-host backup approach that ensures even the most performance intensive “Monster VM” can be easily backed-up. support for private, public and hybrid cloud environments. VM Live Browse to browse Windows-based VM backup images retained in a SnapProtect SnapCopy.